PRESERVE! Start a bird sanctuary, nature preserve or green cemetery ~ 35 acres have 1-d-1 habitat exemption for low tax rate. DREAM! 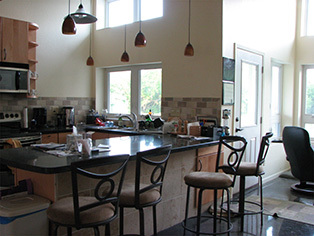 Multiple home sites ~ Begin a retirement village, retreat center, or farm & art commune. BE OFF GRID! Deep well with RO system ~ buildings perfect for solar & rainwater collection. We are happy to give you a tour of the place. 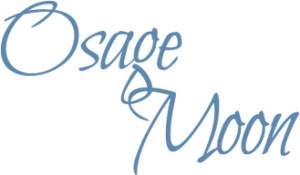 Come experience the magic of Osage Moon. 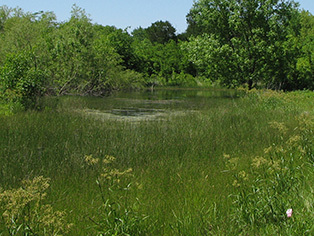 Songbird sanctuary with large overwintering flocks – prime owl habitat, including great horned. Plentiful woodland mammals: armadillo, coyote, fox, opossum, raccoon, skunk. Passionflowers and pecans grow wild – many berry shrubs for birds. Lush prairie meadows of native grasses and wildflowers. 2 deep ponds – rock-bottomed McClung Creek. 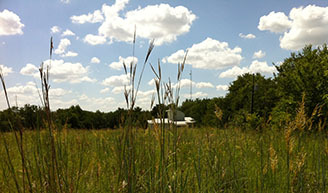 A remarkable 15-year restoration of Bermuda pasture into tallgrass prairie abundant with birds and wildlife. Read about it at GreensourceDFW. Create acres of prairie and prime wild turkey and quail habitat by removing more invasive cedars. 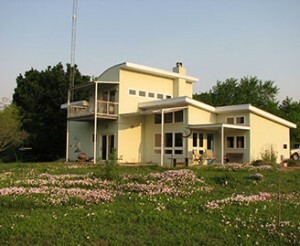 1500 square foot, 2 story, passive-solar house designed by Gary Olp. Reinforced concrete shell: tested to repel objects moving up to 250 mph, extremely energy efficient. 2 bedrooms, 2 bathrooms, living room, gourmet kitchen, 2nd-floor loft and balcony. Travertine fireplace with blower for heating. Electric HVAC. Designed for rainwater collection and/or solar panels. Aerobic septic. Landscaped. Front porch, back porch and large back patio with shade cloth. 72 x 36 foot, 2500 sq. feet, two-story reinforced structure with reinforced concrete floor. 3 garage door roll-up entries. Designed for rainwater collection and/or solar panels. One-room cedar-lined apartment with bathroom and kitchenette. Conventional septic. Landscaped. Propane heat. Full length 20-foot wide awning with full RV hookups. 20 x 34 foot, 800 sq. feet, with electricity. 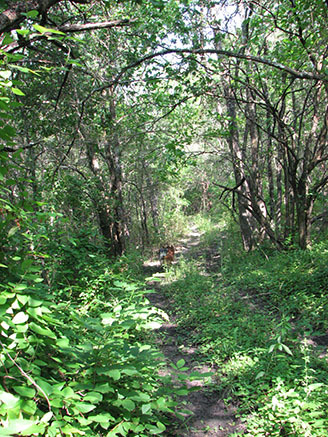 75 quiet acres of woods,creeks and native-grass prairie laced with trails. 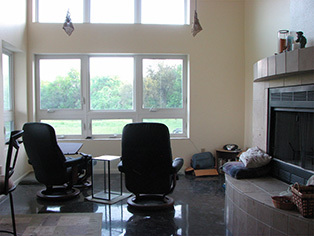 2 bed/2 bath/2 story 1500 sq ft modern Gary Olp eco home. 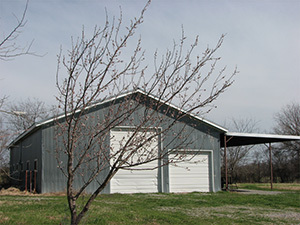 2500 sq ft barn/workshop with 1-room breakroom/apartment. Osage Moon was lovingly created by Amy Martin and Scooter Smith. 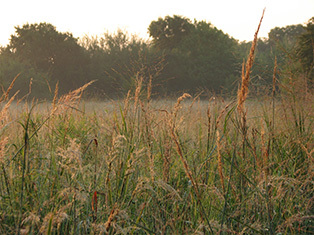 Restoring the land to its prairie heritage was the most nurturing time of our lives. But retirement and health challenges intervened, and travel beckons in our senior years. 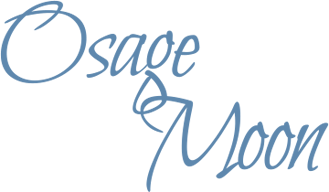 Though we love Osage Moon dearly, we seek new owners whose lives will bloom along with the land. 600-foot semi-artesian well with attached RO system – limitless, permanent water. 200-foot well for livestock, crops and filling ponds. Great cell phone and satellite television reception. Fully fenced with two inset steel pipe entry gates.